Showing at Tyler Rollins Fine Art, a New York gallery which specializes in Asian art, Jakkai Siributr’s Karma Cash and Carry features a series of textile compositions alongside installation and video works. Not a first for Siributr, the theme of materialism and Thai cultural heritage, a significant part of which is the Buddhist religion, resurfaces with Karma Cash and Carry. 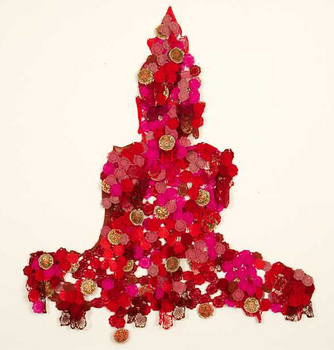 In 2008, Tyler Rollins featured an installation by the artist called Temple Fair, challenging notions of religion, society and politics in the Thai context. Siributr’s current exhibition extrapolates the concept of everyday materialism in religion as a Karmic convenience store, where merit can be bought and sold. Making use of daily objects and ritual practices, his work puts forth powerful visual stimulus to encourage an understanding of the growing consumerism that afflicts every social practice. Drawing from an ancient legacy of Thai textile art, the artist’s work primarily uses the textile medium with a contemporary sensibility. Maintaining a crucial relationship with the legacy of Thai textile, Siributr’s use of fabric in Karma Cash and Carry pushes the boundaries of the medium. Additionally, Siributr uses the video format for the first time here. Evoking a cosmopolitan space where popular culture mixes freely with ancient faith, the installation presents the loss of the sanctity of the essentially non-materialistic Buddhist faith. Siributr himself is a practicing Buddhist and has often articulated deep concerns about the commercialization of the Buddhist faith. In Thailand however, such articulations are unwelcome by the Government and the largely Buddhist polity. To battle this, Siributr tactfully appoints irony and satire to veil his dissent. Jakkai Siributr is considered one of Southeast Asia’s pre-eminent textile based artists and his work is often politically charged. He also featured in Viewpoints and Viewing Points – 2009 Asian Art Biennial in Taiwan. Karma Cash and Carry is on at Tyler Rollins Fine Art, New York, until 5 June, 2010.